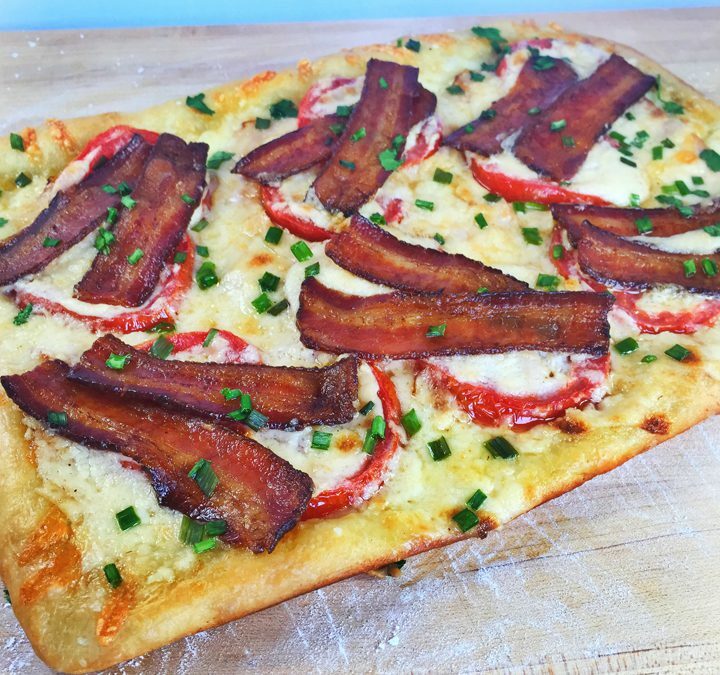 Serve our easy Hot Browns at your Derby party in a delicious flatbread. We’ve taken this famous dish and converted it into a flatbread with six “sandwich size” single serving pieces or cut those in half for 12 smaller bites. To make the recipe, we covered thinly-rolled pizza dough with white cheddar, thin slices of roasted turkey and topped those with additional white cheddar, sliced tomatoes, Mornay cheese sauce, and bacon. Then baked it to cheesy, bubbly deliciousness. As a plus, you will have extra cheese sauce. Save it to make delicious pasta for another meal. To make the Mornay sauce, melt the butter in a medium saucepan and whisk in flour until combined. Cook until thick roux forms. The mixture should look like wet sand. Whisking frequently, continue cooking for 2-3 minutes until the mixture turns a blonde color. Whisk in the heavy cream and cook until the mixture thickens about 2 minutes. Immediately remove from heat and stir in the cheese, ⅛ teaspoon salt, nutmeg, and hot sauce. Stir until the cheese melts, then pour into a high-speed blender and blend until the sauce is creamy and thick. Preheat the oven to 425°F. Arrange the bacon pieces on a rack set over a foil-lined baking sheet. Cook until golden and crisp, about 30 minutes. Remove and drain on paper towels, turning over once to drain both sides or blot off excess fat. Increase the oven temperature to 450˚ F.
Slice the tomatoes and sprinkle lightly with salt. Place on paper towels, and cover with another paper towel. Press gently to remove any excess water. Place tomato slices, two together alongside each other for form 6 “hot browns.” Add two tablespoons of cheese sauce over the tomatoes and gently spread to cover. Place in the oven and bake for 15 minutes, remove and top each set of tomatoes with two pieces of bacon. Place back in the oven and bake for 2 minutes more or until the edges and bottom of the pizza are browned. Remove from the oven and cool slightly. Remove from the pan and top with chives and parsley. Cut the flatbread in half lengthwise then into 6 long pieces for individual “hot browns” or into 12 pieces.